As the provincial capital of Ningxia Hui Autonomous Region, Yinchuan is a famous historical and cultural city of China, which was once the capital of the Xixia Dynasty (1038-1227 in history, and it’s the economic, political, financial and military center of Ningxia Province. 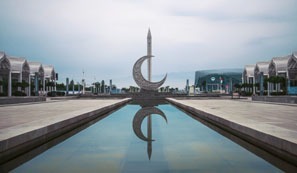 Yinchuan is known as an abundant place beyond the frontier (the Great Wall) of the southern regions of the Yangtze River with the Helan Mountains to the west and the Yellow River to the east. The Helan Mountains measure 150 kilometers (93 miles) long and 30 kilometers (19 miles) wide with their peaks at 3,556 meters (11,667 feet) above the sea level. With an area of 9,555 square kilometers (102,849 square feet), Yinchuan is where the Central Plains culture, the Frontier Fortress culture, the Silk Road culture, Islamic culture and Xixia culture are combined together, and you can immerse yourself intoappreciatingthe magnificent desert scenery, mysterious Xixia culture and the old Yellow River civilization there. Suyukou National Forest Park, it’s a vast stretch of trees and flowers, including towering spruces, pines, clove trees and cherry trees. The Golden Water Tourist Area, it backs on to Maowusu Sandlot in the north and neighbors the Yellow River in the west, which is a wonderful place to appreciate the magnificence of the Yellow River and the vast desert. Shahu Lake, it’s famous for its unique landscape with golden sands, blue water, verdant reeds, flying birds, swimming fish and distant mountains. Mausoleum of the Xixia Dynasty (1038-1227), it’s the final resting place for nine emperors and 200 royal members of the Xixia Dynasty (1038-1227). Helanshan Rock Paintings, they’re distributed along the Helanshan Mountain valleys in the form of human figures and animal patterns, such as horses, deer and wolves. 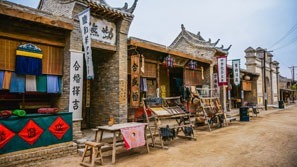 Zhenbeibao West Film City, it’s has a primitive, wild and desolate style, and is where the famous films such as Red Sorghum,New Dragon Inn and Talk on the Journey to the West were shot. Yinchuan belongs tothe continental arid climate with four distinctive seasons, featuring a warm spring, a short hot summer, a cool autumn and a long cold winter, and it has an annual average temperature of 9°C. Yinchuan has a sunshine duration of 2,800 hours to 3,000 hours and over 185 frost-free days, where theannual precipitation is about 200 millimeters. The ideal times to visit Yinchuan are in early summer and autumn. You can participate in the Hua’er (Flower) Festival during May and June, and you can also take part in the Ningxia Yinchuan International Yellow River Culture Festival in September each year. Yinchuan dishes are characterized bya combination of Han-style dishes and Hui-style dishes. 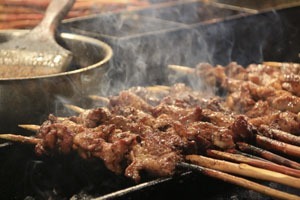 Most Han-style foods in Yinchuan are of a north-west China flavor, and the famous Yinchuan dishes includesteamed young lamb, shredded beef and lamb, mutton eaten with hands, entrails of a sheep, pita bread soaked in lamb soup, and roastpork with three fresh delicacies.Here is a list of famous restaurants in Yinchuan. 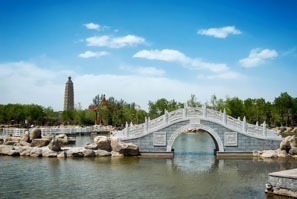 As a famous tourist city, Yinchuan is dotted with hotels of various levels, of which the famous ones are listed below. Yinchuan is convenient for all kinds of vehicles, where a dimensional transportation network of airways, highways and waterways has been formed, and Yinchuan Hedong Airport can be used by Boeing 747s and other jumbo passenger aircrafts.In addition, Yinchuan inner-city transportation is also convenient. Yinchuan Hedong Airport (east of the Yellow River, Linhe Town, Lingwu and Yinchuan) has more than 40 domestic flights to over 10 major cities each week, including Beijing, Guangzhou, Shanghai, Xi’an, Hong Kong, Nanjing, Chengwu, Wuhan, Kunming, Taiyuan, Urumqi, Jinan, Hanghzou, Zhengzhou, Qingdao and Dunhuang. International flights to Dubai, Seoul and Bangkok are available in the airport. In addition, the airport shuttle buses are available between Hedong Airport and Yichuan Aviation Mansion, and it costs about 30 RMB from the airport to Yichuan city center by taxi. 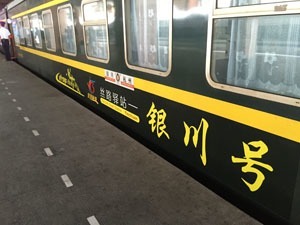 Baotou–Lanzhou Railway runs through Yinchuan, which links Beijing–Baotou Railway, Lanzhou–Xinjiang Railway, Lanzhou–Qinghai Railway and Lanzhou–Lianyunguang Railway. There are direct trains from Yinchun Railway Station to Beijing, Lanzhou, Hohhot, Baotou, Datong, Zhangjiakou and Qingtouxia. Yinchuan Railway Station is located at 710, Shanghai West Road, Xixia District, and bus 1 and 3 will take you there from Yinchuan city center. Yinchuan has four bus stations now: Yinchuan New Bus Station, Yinchuan Nanmen (South Gate) Bus Station, Yinchuan Tourist (North Gate) Bus Station and Yinchuan West Bus Station. Yinchuan New Bus Stationis located at Qinghe South Street, Xingqing District of Yinchuan, from which the buses operate from 7:30 am to 6:30 pm each day, and it is accessible by taking bus 1, 3, 12, 23, 19, 101, 37, 38, 102 and 302. Yinchuan Nanmen Bus Station is situated at 22, Nanxun East Road, Yinchuan, where the buses operate from 6:30 am to 5:00 pm each day, and bus 1, 31 and 102 will take you there from Yinchuan city center. Yinchuan Tourist Bus Station sits at 40, Donghuan North Road, Xingqing District, Yinchuan, where the buses for the Mausoleum of the Xixia Dynasty(1038-1227), Zhenbeibao West Film City, Suyukou National Forest Park and Golden Water (Jinshui) Garden are available.Bus 3, 11, 18, 20, 30, 37 and 49 will take you there. Yinchuan West Bus Station is located at 109, Xingzhou North Road, Xixia District, Yinchuan, and bus 1, 11, 18, 30, 36, 41, 42, 45, 101 and 502 will take you there. Over ten bus routes operate between Yinchuan Old City Area and Yinchuan New City Area. The sightseeing buses 1 (游), 2 (游) and 3 (游) are also available on Xinyue Square of Yinchuan, which leave for the Mausoleum of the Xixia Dynasty(1038-1227), Helanshan Rock Painting Scenic Area and Zhenbeibao West Film City respectively. The starting price of taxi is 5yuan for the first three kilometers (1.9 miles), and after that you’ll be charged one yuan per kilometer.